When I went apple-picking last week, I bought a wonderful, vibrantly red candy apple. I knew, right then and there, that I would have to use some of my freshly picked apples to make my own. I ended up deciding to make caramel apples... and what a disaster it was. One of my friends was celebrating his birthday and my plan was to bring him a few caramel apples as a gift. I had never really made caramel apples, but how hard could it be? Well, as it turns out, it's not always that easy! I used a pretty standard recipe at first but for some reason, the caramel would just not stick to the apples. The lovely amber-colored deliciousness dripped down the side of the apples, leaving a pool of soft caramel at their base. This morning, after a little research, I picked myself up and tried to tackle the monster again. What a difference experience it was this time around! The temperature of the caramel is definitely key to successful caramel-coated apples. You want the coating to be soft enough to be able to coat the apples, but not so soft that it drips and doesn't adhere to the fruit. I added a little molasses to the caramel this time around, which added great richness to the color and the caramel flavor. My tip is to dip the apple in the caramel while it's still hot enough, coat the apples, and place in the fridge immediately to harden for 15 minutes. The moral of the story might be not to make things for the first time when the plan is to give them away... ! Wash the apples and thoroughly dry them. If they are still wet, the caramel will not stick to the skin. Remove the stems, and insert a wooden stick at the top of each apple, about half-way through. The apples should securely cling to the stick.Line a baking sheet with parchment paper and lightly grease. In a saucepan on medium heat, add the sugars, butter, corn syrup, molasses, salt and half of the cream. Swirl the pan to make sure all the ingredients come together. Once they have, add the remaining cream. Cook on medium heat for 10-12 minutes or until the temperature of the mixture reaches 240F. Remove the caramel from the heat and wait for the liquid to slightly cool (2 minutes). Using a swirling motion and carefully tilting the pan, coat the apples with caramel, leaving an untouched apple circle where the wooden stick is inserted. Let the excess caramel drip off, and place the apples on the parchment paper. Immediately place the apples in the fridge to harden. You may have to do this in batches so that the first coated apples don't stay at room temperature for too long: the quicker they get in the fridge, the better! If the caramel starts to harden and is not thin enough to coat the apples, simply place the saucepan on the heat for a couple minutes before coating more apples. Leave the apples in the fridge for 15 minutes to harden. Once they have hardened, leave at room temperature. Package as you please. Enjoy! these look too good to eat!! With the success of these lovelies in mind, you’re well-prepared for your friend’s birthday next year. I'll have to give these a try! These are so beautiful I don't think I could bring myself to bite into one. Thanks so much for the tip about the caramel. You've made it easier for the rest of us. Thanks. I always love your photos--so crisp and clean. Outstanding! Those are beautiful. I am not so good with caramel :-O but yours looks divine! Wow, seriously wow. They look fabulous! I'm really glad they finally worked out! I remember having candy aplles as a child that had so much red food coloring in them that it took my mom almst a week to get the red from our lips and cheeks. This is a much more civilized version. My kids will love it!!! These look yummy and they are pretty. A good combination - good looks and good taste. They look absolutely beautiful!! I have never made anything (successfully) with caramel yet. There is something about it that doesn't really work with me I think. That photo is just gorgeous too! Thks for the tip! But I love your pic ... those apples almost look fake 'coz they're so beautiful and glossy! Your apples look fantastic. They are hard to make but you've created such beauties. Sweet packaging too, what a delicious b-day gift. They certainly don't look as though they were a disaster first time around. What a lovely idea. It's one of my foibles that I am usually trying out something new when it comes around to making something for others - spirit of adventure maybe! Oh, they are soooo beautiful! Perfect. I love these! they are almost too pretty to eat! I just made some caramel apples too & you're spot on about what the key is... get that caramel the right temperature before dipping! Placing them in the fridge right away after dip is a perfect idea. Those are much prettier than mine were! I used all brown sugar in mine and it made a very rich caramel. Choclette: The first batch didn't get to be photographed.. they were too much of a disaster! 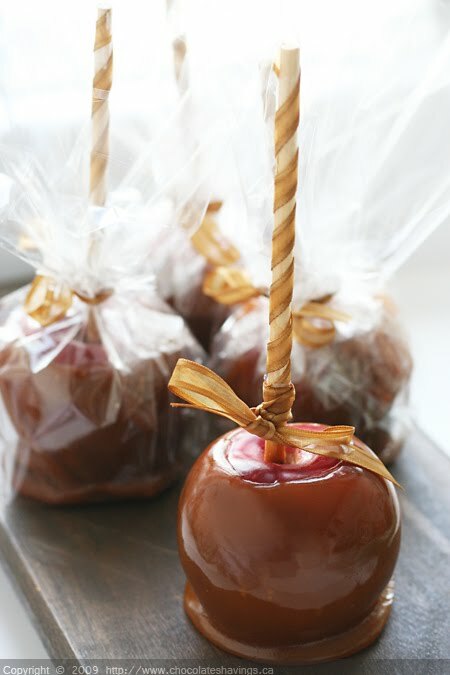 Such beautifully decorated toffee apples. Ha ha, I'm always thinking "How hard can this be? ", then have to eat my disasters. You achieved perfection second time round! I'm really glad you decided to make them again after the first failure - otherwise we would never have the pleasure of seeing such beautiful caramel apples! Holy Tuna! This is AMAZING! They look super good to eat. I think I need to call the mental hospital because I am going crazy for these. Hmmm, thanks for the info. I have every intention to make caramel apples myself. Yours look excellent and like the addition of molasses. Those are really beautiful. sounds familiar, giving away something never made before. My hubs always marvels at that concept. Very nice caramel apples indeed! Just would like to know how you upload bigger picture on your blog. Is it by upload to photobucket first? Or you just resize the width and height? Beautiful pictures and you were so creative with the ribbon decorations! Your caramel apples are lovely! I've heard that you should also make sure your apples are at room temperature when you dip them so that the caramel doesn't fall off. I made caramel this year with a recipe that included sweetened condensed milk. I didn't care for it...I'll be sure to bookmark this recipe for next year! marzipanmom: That's exactly right! If the apples are too cold, the caramel will not stick to their skin. The ribbons on this are adorable! I love the light coming in over the apples. Beautiful. These are beautiful, perfect caramel apples, the joy of my childhood. And when it comes to me, even if I make them thirty times perfectly I'll screw up the time I make them to give them away. Luscious! These look delicious. I am making these next Fall!